President Richard Nixon once visited the Lincoln Memorial at 4 AM to chat with protesters who were against the Vietnam War. Every time I get the opportunity to view the Lincoln Memorial, I can only imagine the next great Transformers movie. Who could blame me? Imagine a twenty-eight-foot-tall standing mega-Lincoln going toe-to-toe with a Decepticon. However, it turns out this mammoth monument was never planned to appear as it does today. 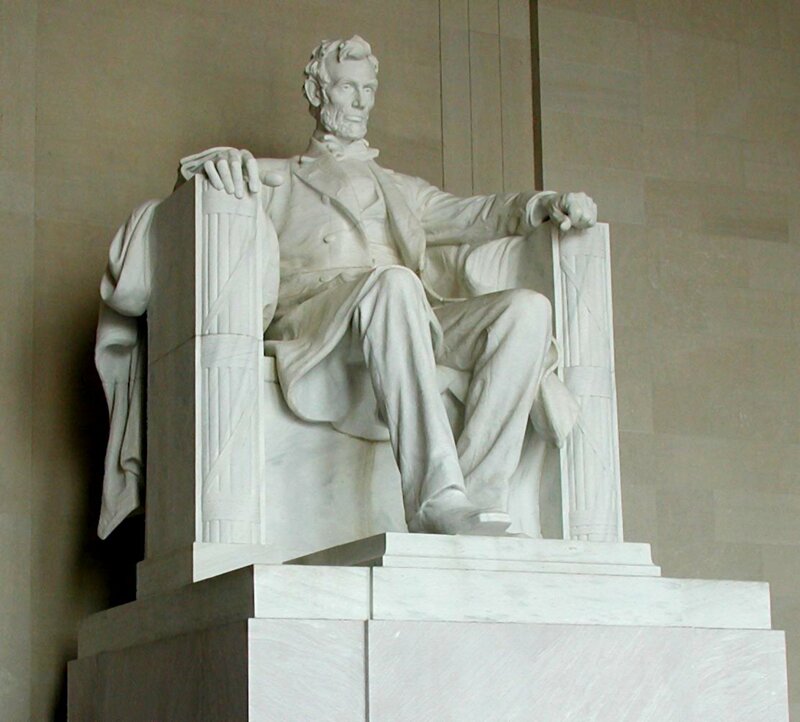 In 1914, sculptor Daniel Chester French, with the cooperation of famous architect and fellow bromantic Henry Bacon, began to design the monument following their selection by the Lincoln Memorial Committee. While Bacon designed the building, French sculpted the Lincoln within. This dual approach to monument design gave the memorial substance but also offered two distinct challenges. The first was an issue of scale. Originally, French envisioned a statue of no more than ten feet in height, but realized a comparatively tiny Lincoln in a vast building would look ridiculous. He continuously increased the scale until Lincoln reached his final sitting height of nineteen feet which represented a near doubling in the size of the concept. Combined with his throne and its pedestal, the total statue height is thirty feet. The second issue was light. French’s design relied upon a large skylight to allow natural light to shine down upon Lincoln but this design element was never implemented in the final construction of the building. This meant the only natural light entering the monument would come from the open face at the east where Lincoln gazes upon. The intruding light caused Abe’s face to appear as mine does in a calculus lecture: empty and without hope. As this problem only appeared after one hundred and seventy tons of Georgia marble in twenty-eight separate blocks had already been chiseled, moved, and assembled, French considered it to be a disaster. (Also similar to me in a calculus lecture.) Without his skylight or a reasonably priced moving company, French decided to get creative with his design by the addition of bright overhead electrical lights which would create the light he required for Lincoln to wear his stoic, presidential face. In 1922, after eight years of construction, the monument was commemorated in a massive celebration involving fifty thousand attendees including Abraham’s son, Robert Todd Lincoln. Decades later, Abraham Lincoln remains as one of America’s most beloved monuments and has even gained folklore surrounding its symbolism. Some say they can see Lincoln’s hands positioned in a way to represent his initials in sign language. Others claim Robert E. Lee’s profile can be viewed protruding from the back of Lincoln’s head like Voldemort in the Philosopher's Stone. Though both rumors have been thoroughly discounted by the U.S. Department of the Interior, viewers still enjoy believing French purposefully added a few secrets to arguably his greatest work. Jacob, Kathryn Allamong. “Testament to Union: Civil War Monuments in Washington, D.C., Baltimore” The Johns Hopkins University Press. 1998. pp 119-125. 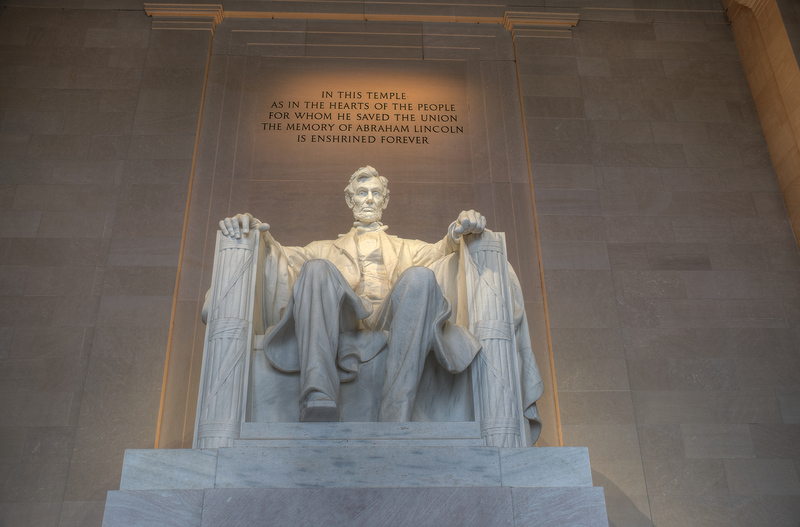 Abraham Lincoln (1920) is a colossal seated figure of United States President Abraham Lincoln (1809–1865) sculpted by Daniel Chester French (1850–1931) and carved by the Piccirilli Brothers. It is situated in the Lincoln Memorial (constructed 1914–1922), on the National Mall, Washington, D.C., USA, and was unveiled in 1922. Stylistically, the work follows in the Beaux Arts and American Renaissance traditions. Check out the full Wikipedia article about Abraham Lincoln (1920 statue).